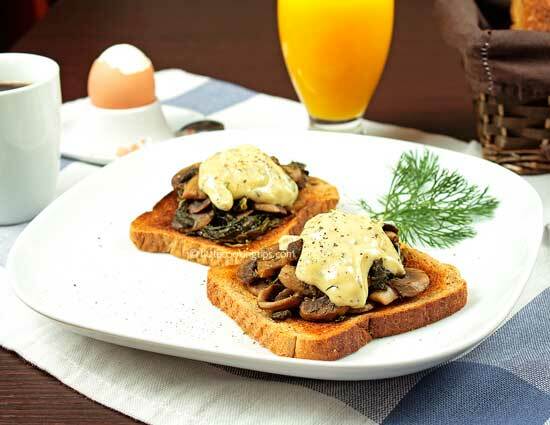 ﻿ Open faced Spinach and Mushroom Sandwiches: A great idea for brunch! Are you tired of scrambled eggs and omelets? Would you like a different way to start your day? Are you having people over for a Sunday brunch? Then, this is the ideal recipe for you: Open faced Spinach and Mushroom Sandwiches! We like making these sandwiches on those lazy Sunday mornings, when we're having a late breakfast or a brunch. The result is always filling and delicious! Toasted bread is the base for this recipe. It's the base for any classic breakfast after all. The main ingredient in this recipe is the humble, common mushroom. Mushrooms have protein and are a great replacement for meat. They're cooked with spinach, which adds texture and flavor. Spinach is also a great food, rich in iron and antioxidants.We recently read a great study by Well-being Secrets, which you can find here if you want to know more about spinach and its health benefits. But back to our recipe dill is also added, to enhance the flavor and help combine the flavors. Finally, the mixture is cooked with the addition of a little sweet white wine which offers some extra aroma. The final step is deglazing the pan we cooked in, with some heavy cream which is transformed into a delicious white sauce, incorporating all the flavors of the previous pan's contents. The three parts of the sandwich, bread-mushroom mixture-sauce are then assembled and served with a little grated Parmesan. We often like to serve hard boiled eggs to accompany those sandwiches as well. Of course this recipe is suitable for vegetarians and doesn't lack anything in taste. It's healthy, delicious, filling and great way to start your Sunday mornings! Preparation: Toast the bread slices. You can also use your oven broiler if you don't have a toaster. Add the butter in a large skillet and put it on medium to high heat. Once the butter starts to foam up, add the onion and stir for half a minute. (pic.1)Add the mushrooms and stir for 3-4 minutes more (pic.2). Add half the spinach. Once it's reduced in size, add the rest as well and stir for half a minute (pic.3). If you're not using baby spinach, stir for 1 full minute instead of half. Add the dill and stir to incorporate (pic.4). Add salt and pepper. Pour the sweet wine and cook until it completely evaporates. Remove the mixture from the pan. At this point, the mixture must be relatively thick and dry (pic.5). Divide the spinach-mushroom mixture on the 4 toasted bread slices and add the creamy sauce on top. Serve as it is, or add a little grated parmesan on top and some hard boiled eggs on the side. 1. The baby spinach is usually available washed and packed in the salads section of the super markets. 2. You can also use different mushrooms to get a different taste. 3. You can omit the sweet wine if you don't have any or you don't like using it. The end result is also delicious in this case!